Charles B. Mitchell Vineyards believes in giving rare and unique experiences through wine. With the winery’s various vineyard-specific wines, you are able to taste the distinct flavors that highlight the importance of place. But why is place important? Wine comes from many places. The source of the grapes used in each wine can be as broad as several vineyards throughout California or as specific as the estate vineyards at Charles B. Mitchell Vineyards. 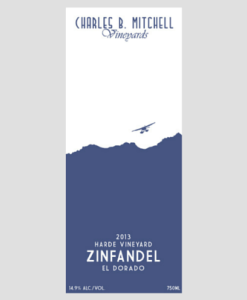 If a wine is labeled, “El Dorado Syrah,” for instance, it means the majority of the grapes used in its production came from vineyards throughout El Dorado. Similarly, a wine labeled, “California Zinfandel” was made with grapes from vineyards throughout the state—anywhere from Northern California to the Coast to Southern California. Unlike wines from broader origins, wines that are from single-vineyards are unique and limited. Each vineyard can only produce a certain amount of grapes in a given year, making each bottle rare. Single-vineyard wines have distinct flavors and aromas completely dependent on where they are grown, and depending on the climate, change from year to year. The isolated sites also ensure consistency and care in production, creating a higher quality product for you to enjoy.